As you may already know, this has been one of the worst years in recent history for the common cold and the flu. Germs are relentless in the winter. With a lack of fresh air and sunshine, your employees and their families stand little a chance defending themselves against the inevitable: the sick day. However, you can be proactive as an employer. With a little luck you may manage to keep productivity levels to a normal level through the winter. 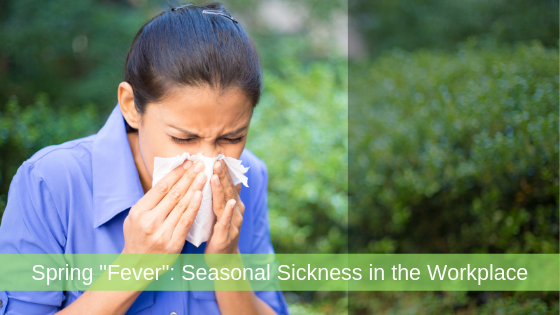 Here are a few ideas to stay on top of the cold and flu season. Send out an email to everyone asking them to (please!) wash their hands multiple times during the day, use disinfecting wipes on their phones, keyboards, and desktops. You can guess that this is the most important action all of us can take. If someone is feeling sick but not sick enough to stay home, offer them the opportunity to work from home if possible. With technology, they can still attend meetings, collaborate on projects, and make calls to clients. There is no need to come in and get overtired, letting defenses down, and making it worse. Give people a break. Parents and caretakers have it rough when someone at home is not well. Don’t inadvertently make them feel bad about taking care of a sick child or family member. Empathy goes a long way with your employees when they have conflicting priorities. Offer benefits that allow plenty of sick time or personal days. It shows that you care and appreciate them, and value their time as well as their personal commitments. In the end, let people stay home if they are sick. You don’t want what they have traveling around the office, potentially wiping out an entire department. A day out recovering is less of a productivity loss than a week at home with a full blown head cold. Need additional help during the winter months to cover employees who are out? Chameleon Group can jump in and cover making sales calls, managing inbound marketing inquiries, and setting appointments. We are here when you need us.